112 E. Van Buren St.
Visibility/Location: This event was pretty easy to find. It was conveniently located in the main square of Woodstock. Signage could be improved, though. Finding parking also may be an issue, as it gets later in the season. When we arrived, all of the parking spaces around the square were full, so we had to park a couple of blocks away. Also keep in mind that this haunted house is out in the open and not covered, so plan accordingly, in case of inclement weather. Wait Entertainment: There really wasn�t much in terms of wait entertainment, but we came very early in the season (before October) and were able to get in right away, so there was no need for wait entertainment. Crowd Control: There weren�t a lot of customers on the night we attended, so I really can�t judge how they would have handled a large crowd. This attraction was a collection of very simple scenes, with a haunted manor theme. Some of the more memorable areas included the detailed study and the playroom. The study featured bookshelves filled with books, a large desk and an old leather chair. The entire room was accented with cobwebs. In the playroom, there were stuffed animals adorning the walls and hanging from above. The hallways were mostly plain black walls, providing a simple transition between the scenes. It was very quiet in a lot of areas, so some additional sound effects or music would have helped enhanced the spooky atmosphere. Also, since the structure wasn�t covered, occasional road noise and horn honks detracted from the overall feel of the event, reminding us that were in the middle of the town square. They seemed to be light on actors on the night that we visited, as some of the hallways and rooms were empty. Many of the actors were wearing dark street clothes or simple costumes, some of which were splattered with blood. There were a couple of exceptions, though. The actor in the study was wearing a 3 piece suit & a ghoulish mask, and the actress in the first room was wearing an elegant old dress, with a long black wig. There was a mix of acting styles throughout the attraction. A few key actors interacted with patrons walking through the scenes, while the rest of the actors popped out from behind curtains and corner alcoves. There were even a couple of ghouls crawling on the ground, moving toward our group. The actors were very enthusiastic and on-task, for the most part, with the exception of two actresses near the end, who we saw chatting. Timing of some of the scare attempts was off, but it was early in the season, so they probably weren�t in the groove yet. On their website they advertised that the event was appropriate for ages 14+, but our assessment differed. 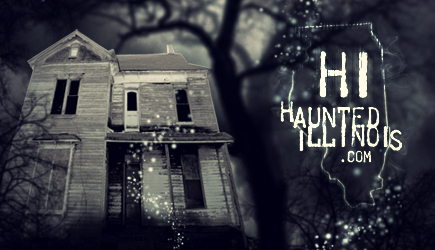 There were some great surprises along the way, but during our visit, the scare factor was fairly low, making this a family-friendly event appropriate for most haunted house fans. For a first year event, they did a good job. For the admission price, the tour was fairly brief, but discount coupons were available at local businesses, to make the admission even more affordable. It should also be noted that all proceeds of this event will go to the Family Alliance, a charity group that serves McHenry County and surrounding areas. From what we were told, this will be an annual event, so I look forward to seeing what they put together next year.